This past weekend was my last craft show for a while. 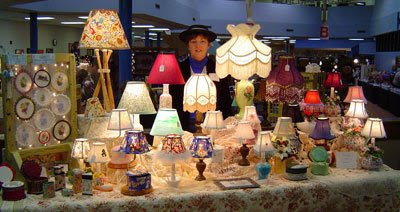 Schoolhouse Craft Show sponsored by Asbury Woods in Erie, PA was an okay show. The students provided the music both days in the afternoon. The jazz band was great; they played some music from Manheim Steamroller, one of my favorites. At times during this show, the crowds were three people deep. This show was full of "real" artists. The show was juried; although that doesn't mean much as some shows that I've done that were juried had less than quality crafts. The quality of products was very good at this show. There was a nice variety of products as well. The floor layout was very unique in that it was an octagon shopping layout. It made it interesting and easy to get lost! There was a man doing wood items with painted sayings like "My dog can't control his licker." Another sign maker had one that said, "Martha Stewart doesn't live here but Bob Vila thinks he does." The show was run very well with helpers all over. The weather was terrible on Sunday. It took us 1-1/2 hours to get to Erie with the snow and wind. However, our trip home was fine. 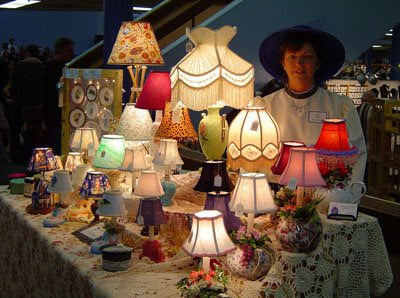 I sold five lamps, including Plum Hayley. The lady who purchased it said her room was just that color. Both Christmas lamps sold: Furry Santa and Gold Present Box. Also the pink heart victorian sold. I'm glad. They are going to spread the light of God's love in each of the homes that they reside in. AH! Love even more!!!!!! Love love love! What time of day are you at your creative best?